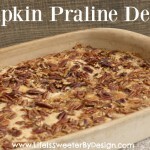 A delicious pumpkin dessert that is good enough to take the place of pumpkin pie! Quick and easy to make too! Preheat your oven to 350 degees F.
Grease or spray bottom and sides of a 13×9 baking pan. In a medium bowl beat the pumpkin, eggs, evaporated milk, sugar and pumpkin pie spice with a wire whisk until smooth. Now you will pour this mixture into your greased pan. It is supposed to be pretty liquidy…so don’t worry! Now you will sprinkle the dry cake mix over the top of the liquid mixture evenly. Get your chopped pecans and sprinkle over the top of the dry cake mix. Take your melted butter and pour evenly over the top of the pecans. Bake 50-60 minutes in your oven until a toothpick or knife inserted into the center comes out clean. Cool for around 30 minutes. You can serve this warm or cool with whipped cream or cool whip on top, if desired. Store any leftovers in the fridge!